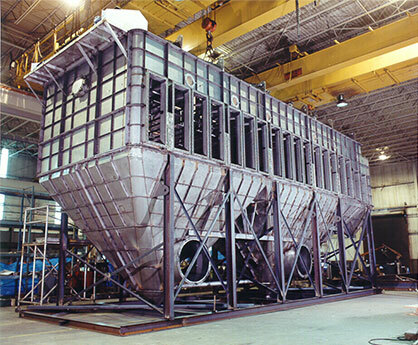 Carrier conventional fluid bed dryers are designed to dry and/or cool a variety of products without the aid of vibration. 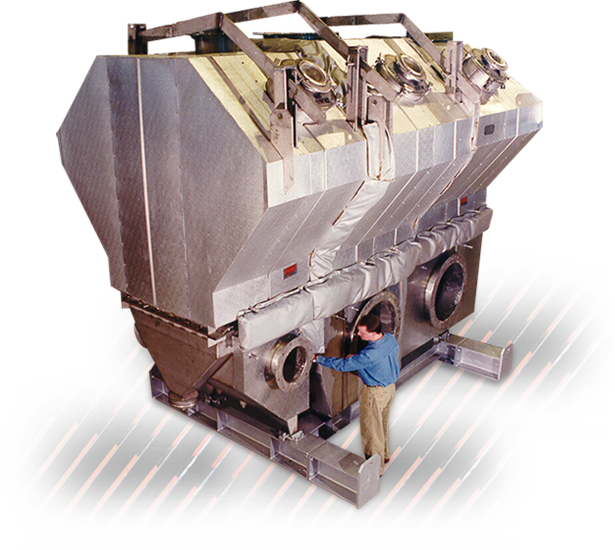 Our static fluid bed dryer systems pass a gas directly through a bed of solid material via a perforated plate, nozzles, or other fluidizing media which lifts and mixes the solids. At a certain gas velocity (the fluidization velocity), the bed will behave much like a boiling liquid. Static fluid beds dryers can be multi-functional, providing drying, cooling, classifying, sterilizing and more in a single unit. Efficient processing without product degradation — Carrier fluid bed dryers provide gentle fluidizing action. Product is continually mixed to promote uniformity. Our fluid bed dryers are easily adaptable to batch or continuous processing. Indirect heat transfer tubes or plates can be immersed in the bed, significantly reducing the size and cost of the fluid bed dryer and increasing energy efficiency. Efficient static fluid bed dryer design transfers heat with low energy consumption. Vibration can be used to aid in processing more difficult products. Variation in process by controlling bed depth, retention time, and product temperature. Sanitary, U.S.D.A (3A) approved construction. Proven performance, our conventional fluid bed dryers offer easy cleaning, rugged construction, are dust tight, and are low maintenance. For more information on Conventional Fluid Bed Processors, refer to brochure #16511. We make your work flow. Copyright 2019 Carrier® Vibrating Equipment, Inc. All Rights Reserved.